The concept of Bi-Fueling is adding a control technology and equipment that permits heavy-duty diesel engines to substitute diesel fuel with clean-burning natural gas. These systems allow tje engines to safely operate on natural gas percentages up to 70% of the total fuel input requirements; substantially reducing operational costs and lowering emissions. Engines converted to Bi-Fuel technology will provide diesel-like efficiency, stability and load carrying capabilities. Displacing a percentage of diesel fuel with natural gas provides a direct operating benefit based on the the fuel costs and the amount of system run time. In high usage applications, a system can pay for itself in a short period of time. Simple Excel-based spread sheets are available from equipment suppliers to assist in modeling the economic benefits of converting your diesel system to Bi-Fuel. 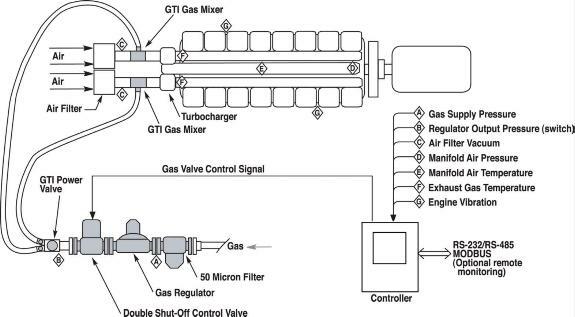 Typically, natural gas is introduced downstream of the engine air cleaner and upstream of the turbocharger. The gas is supplied at atmospheric pressure using an air-fuel mixer that provides gas mixing with air. This air-gas mixture is compressed in a turbocharger and distributed to each cylinder by the engine air-intake manifold. The lean air-gas mixture is compressed during the compression stroke of the piston and ignited by the diesel injector. Since the air-gas mixture is maintained in a lean condition, pre-ignition does not occur. Engine performance during Bi-Fuel operation is equal to normal diesel operation. Heat rejected through the exhaust and water jacket systems are kept within normal operating parameters. Engine response levels to load variation are equal to — or better than — 100% diesel performance due to the unique design of Bi-Fuel systems and the associated combustion characteristics of the air-gas mixture. Similarly, engine load acceptance (for large block loads) meets or exceeds straight diesel performance.